Full size replica NFL helmet by Riddell. These riddell full size football helmets are a replica of what the pro’s wear on the field. This full size football helmet has an ABS plastic shell and steel polyvinyl-coated face mask, along with realistic jaw pads and a chin strap. The officially licensed full size replica helmet is decorated in the team of your choice’s colors and proudly showcases the team logo decals. Stingray boom gaming chair features: Wood frame and polyurethane foam padding construction, Pair of 3″ 2-way speakers, Rounded bottom for tilt action, Battery-powered option for portability, Folds for storage, Fully adjustable volume, Illuminated control knob, RCA input ports, Rugged canvas surface, Mesh padded comfort zone, Built in handle for easy transportation, Audio cords included, Easily hooks up to any video game system, DVD or CD player or any portable MP3 device. 1600 MS Points used to purchase games, movies, apps & more on Xbox Live. Show your enthusiasm with the Wilson® customized football, showcasing 3 smooth, white panels with your favorite team’s logo and your name. It has one completely blank panel, perfect for autographs. Genuine football leather construction, 3 smooth, white panels, top quality leather cover, patented 3-ply VPU bladder, double-lacing for reinforcement,official size and weight. Lounge in comfort while you’re watching the game in this NFL® collapsible video chair from Baseline. Built for durability and comfort, the chair features a microfiber and mesh construction. The chair also folds in half for easy moving and storing. Vibrant team graphics are applied to the chair using a high-pressure heat-transfer process. Mr. 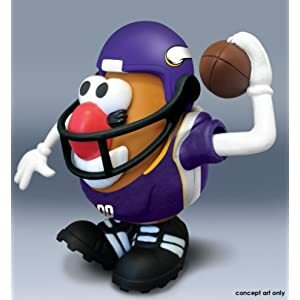 Potato Head, This fun toy can now be dressed up to be a fan or mascot of your favorite team. Each NFL Sports Spud includes a team jersey, helmet, foam finger, football, and other components. A great fan item – a great collectible. Clamshell packaged, comes with Powers Collectibles COA and matching holograms. Starter Kit Includes 12 Month Gold Membership, 400 MS Points, Messaging Chat Pad, Xbox Live Microphone.